If you stop to think about it, you would probably notice that a lot of great stories contain conflicts between child and parent. For example, at the climax of the first Star Wars film, we find out that Darth Vader, the Lord of all galactic evil, is actually the biological father of Luke Skywalker, the protagonist and our hero. Of course, instead of reuniting with his long last father, Luke refuses him, which puts even more strain on their already rocky relationship. 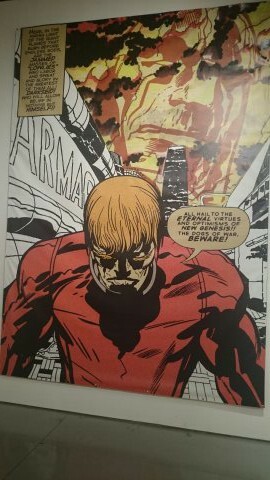 In Jack Kirby’s The New Gods, a similar dynamic is used. Orion, the main character, is the adoptive son of Izaya, the benevolent ruler of a planet named New Genesis. This planet sort of represents a modern utopia with flourishing vegetation and futuristic technology. It isn’t until later on in the story that Orion finds out that he is actually the biological son of Darkseid, the tyrannical ruler of Apokalips. Though Apokalips is literally the planetary twin of New Genesis, it’s features literally resemble that of an industrial wasteland covered in swelling craters oozing lava and fire. Eventually, Orion also finds out that the reason why Darkseid gave him up was due to a peace treaty offered by Izaya. As part of the agreement, the two enemies had to exchange with one another their own sons. In doing this, Izaya’s good-natured son, Scott Free (aka, Mr Miracle) was given to Darkseid. This comic not only utilizes the child vs. parent dynamic but also the nature vs. nurture argument. Take Orion, for example. While he is born into a tyrannical family with a violent background, he is mainly raised by a man who has the exact opposite values of Orion’s family. This supplies Orion with a benevolent; in other words, he is able to somehow repress his violent genetics and utilize the values that Izaya has taught him. Of course, that doesn’t mean he no longer possesses that evil DNA , as it is shown through out the story that he has a somewhat dark side that he constantly struggles with. Naturally, he doesn’t want to turn into his birth father, so he is guarded and defensive most of the time. Now, most would probably assume hat Scott Free is now completely brainwashed into turning into an evil psychopath like Darkseid, his adoptive father. But in all actuality, he’s benevolent and was somehow able to escape Apokalips. Unlike Darkseid, Scott is capable as he eventually marries Big Barda. All in all, in the case of Orion’s genetics and his upbringing, nurture wins; but of course nature sometimes tags along much to Orion’s disdain. When it comes to Scott Free however, nature seems to have won, with nurture taking very little effect.